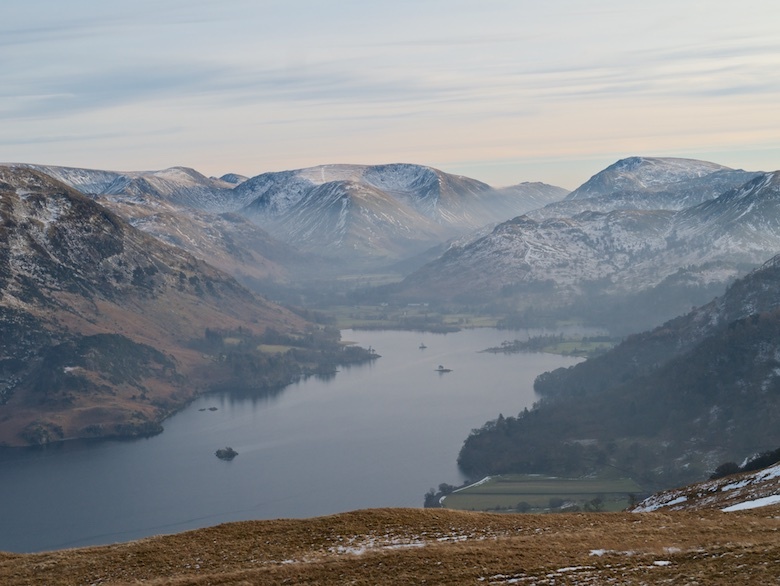 Ullswater should have come with a health and safety warning that morning. 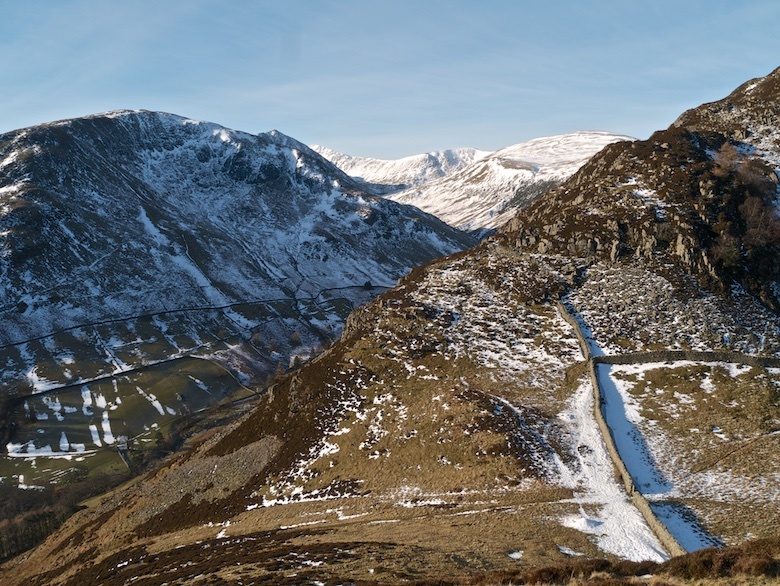 It was hard to keep my eyes on the road as I drove the Bongo towards Glenridding. The waters were mirror calm with a low dense mist floating above the water. I parked in a lay-by and watched a succession of people stop, jump out of their vehicles and take a quick photo. A few gave me a big thumbs up with a smile on their faces. It does look odd when people take photos with full sized iPads though. Starting from Stybarrow Crag we followed the lakeside path towards Glenridding before taking a track that rises above the village. 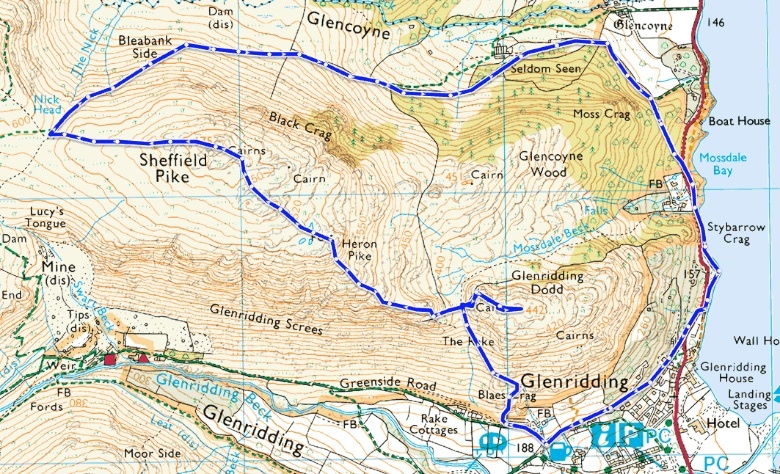 I totally failed to find the start of the path that zigzags through bracken onto Glenridding Dodd. Spotting a couple and their dogs high above I nipped between a row of terraced cottages and bashed my way straight up the hill. Thankfully I intercepted the well hidden path higher up. The strength of the sun along with no breeze meant that Reuben and I were soon panting, my heavy paramo relegated to my sack. 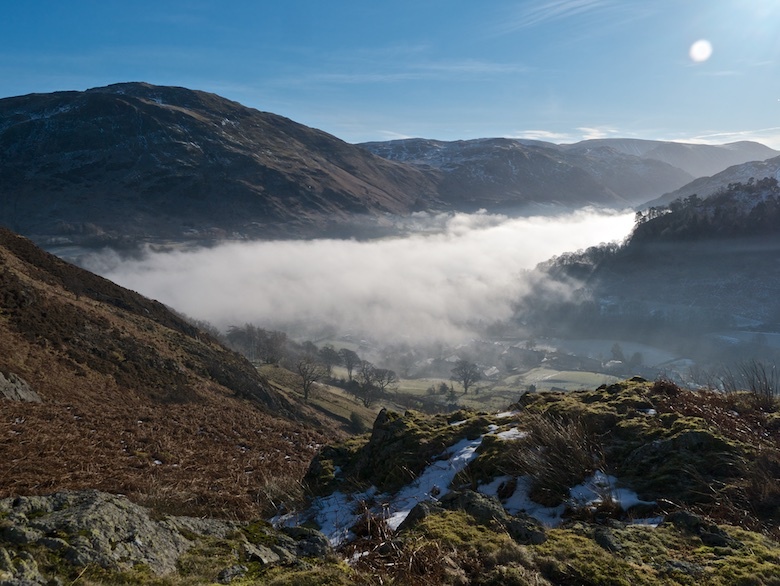 The mist from the lake was drifting south down the valley, obscuring the village below but magnifying the sounds. 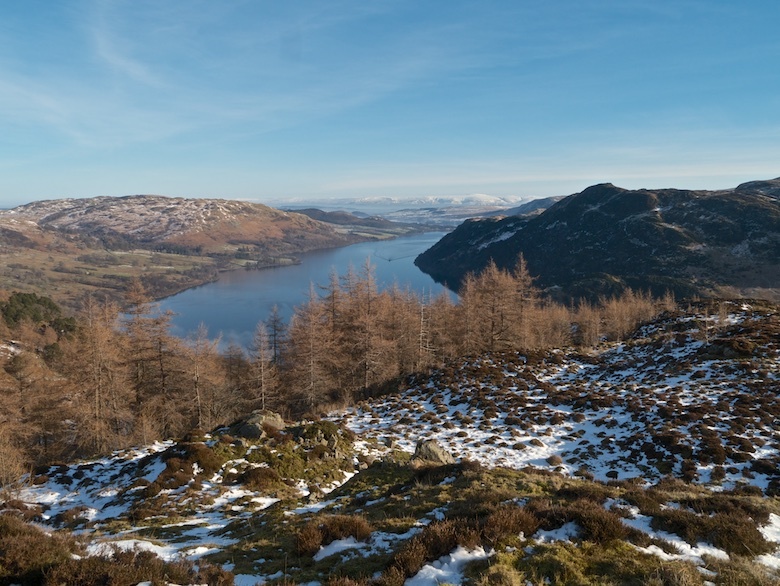 Glenridding Dodd was quickly and easily reached, providing a superb viewpoint down the length of Ullswater and along to the snow clad Pennines on the horizon. My next destination Sheffield Pike looked much higher and steeper than the map suggests and I stood and picked out my route up to Heron Pike on the skyline. We returned some of the way that we had come before attacking the steep eastern slopes. A narrow path led up easily though the heather and rocks and I stopped frequently to take in the views. 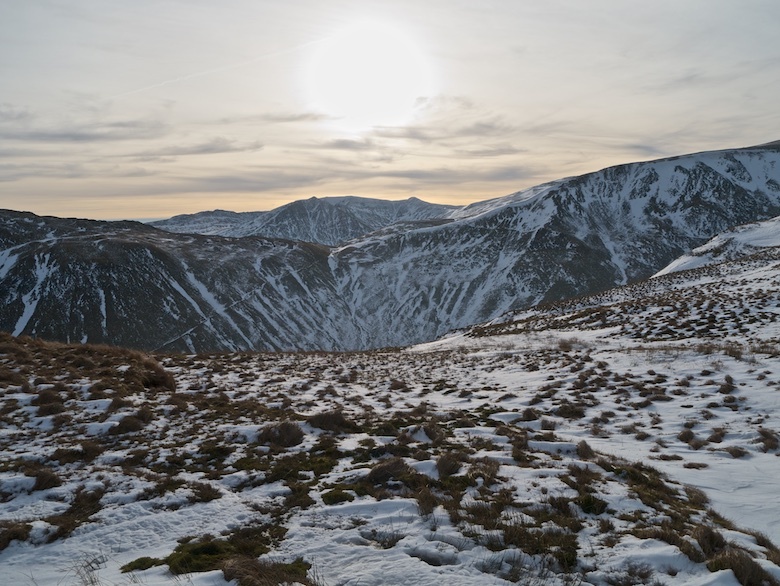 With every step Catstye Cam and Helvellyn grew in stature, the late winter sun giving texture to every snow filled rake and gully. 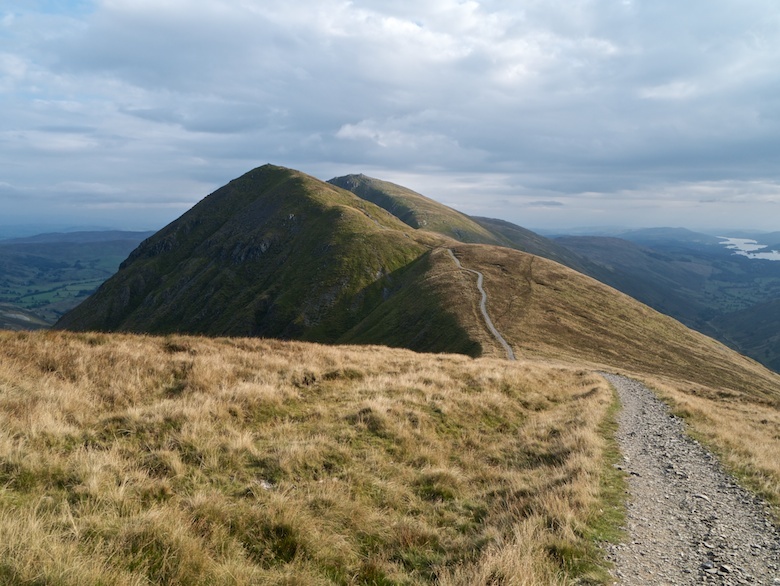 We were soon at the top and admiring the onward route up the Dodds, hills we had walked the previous day. 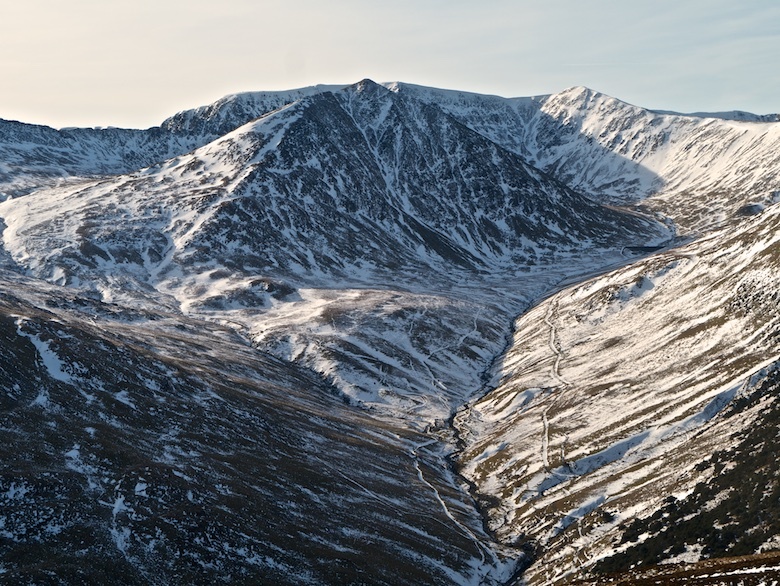 It was tempting to continue and spend the whole day on the fells. However I wanted to be back at the Bongo and driving home before lunch time. The path that descends to the north high above Glencoyne was much trickier than anticipated. 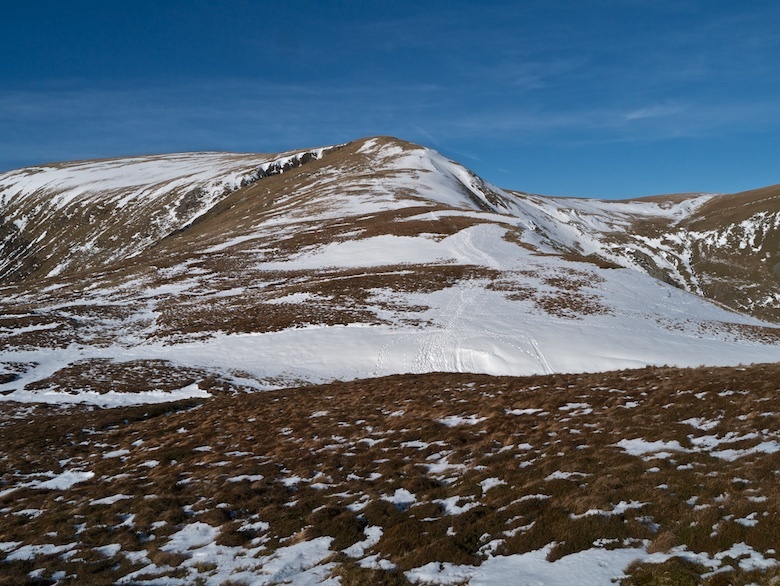 The narrow path was compacted snow and ice above some steep and long snow slopes. Typically I had taken ice axe and crampons with me on the previous two days and not needed them. On what I though was be a shorter, lower and easier walk they would have come in handy but were sitting uselessly in the van. I picked my way along gingerly making use of previous footprints for security, thankfully not suffering any slips or mishaps. Three hundred metres lower and into the woods I crossed into another season, spring was definitely in the air. It was a warm and pleasant walk back to the Bongo and a long drive home. Some days in the hills provide plenty of promise but don’t really deliver. This time there was no real promise as the weather forecast did not look particularly good, in the end it over delivered! 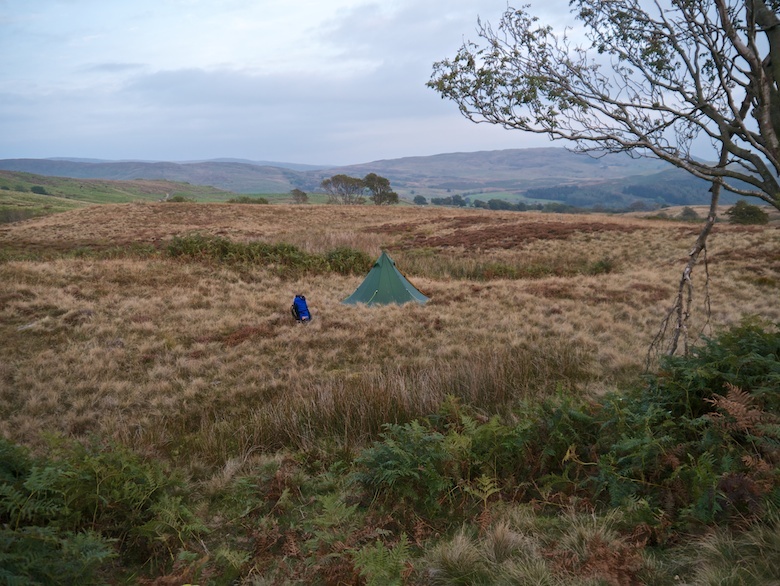 I spent the night in the Bongo in a small car park 400 metres above sea level, a good starting point to do a horseshoe around Deepdale. I woke with Reuben’s head buried under my pillow, dogs do make good hot water bottles. Even if they smell and wuff in the night whilst chasing rabbits in their dreams. The skies had cleared during the early morning leaving the van covered in ice. As I stood outside with a steaming cup of coffee a farmer passed, commenting that I was mad to be sleeping out in the middle of winter. The freezing temperatures overnight meant that the snow was hard and crunchy as we avoided the frozen puddles on the old coach road. 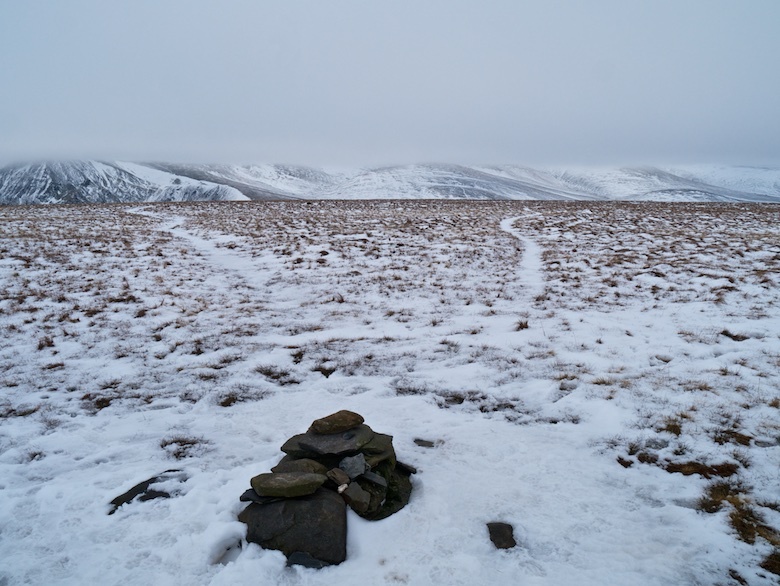 The walking was much easier than the day before when soft melting snow hindered progress and soaked through my boots. 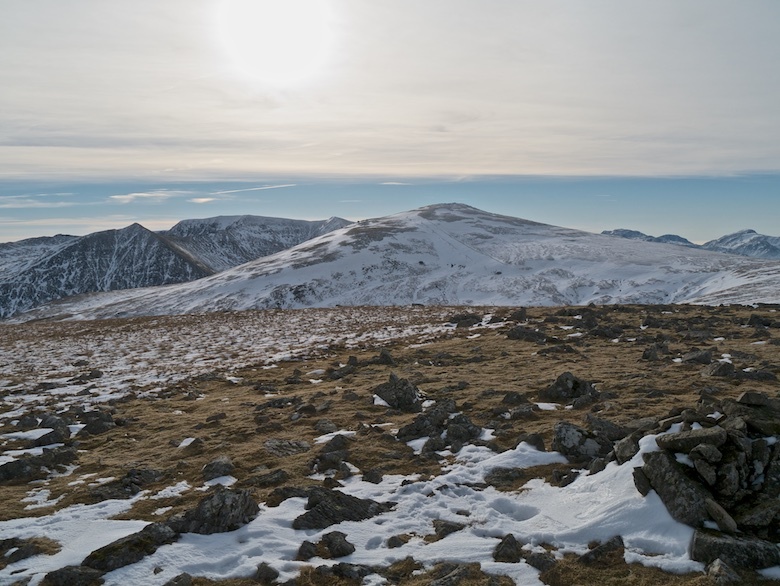 With deep blue skies overhead and snow underfoot the distant Great Dodd looked much higher than its 857 metres. We crunched ever higher and then I was met with the most glorious sight. 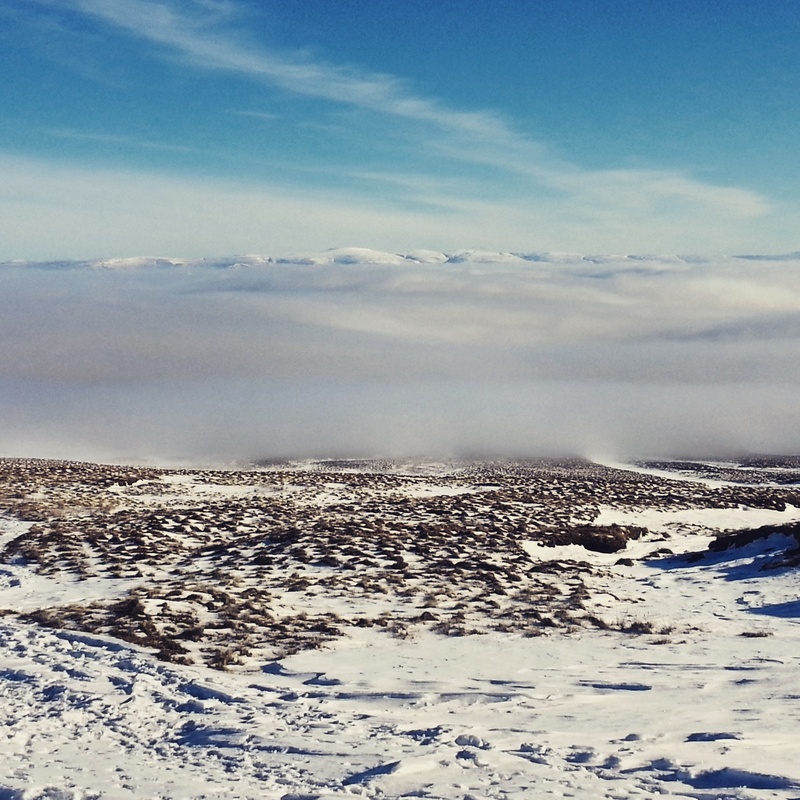 The whole of the Eden valley was full of cloud, the snow-covered Pennines on the horizon poking into the blue sky. 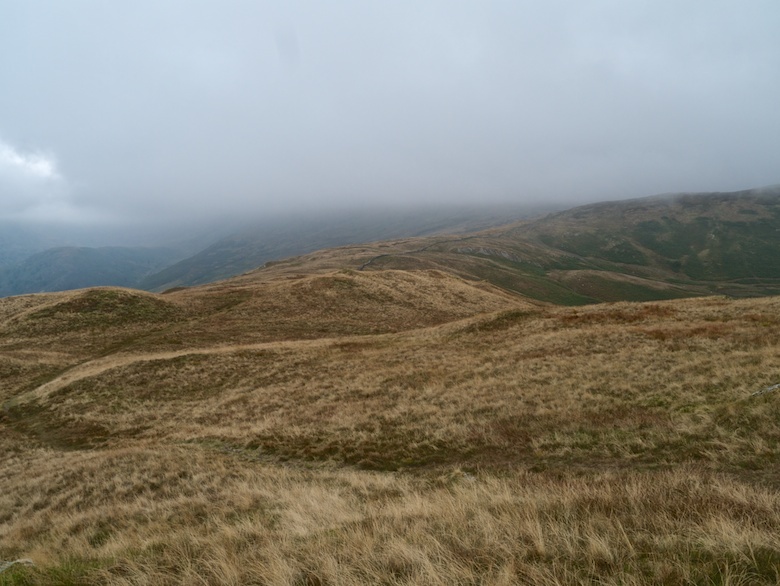 Waves of cloud were lapping over the summit of Little Mel Fell, obscuring it for a while and then its bald grassy dome would reappear. As I climbed I would stop often and marvel at the sight below me. The cloud was rapidly rising and at one point I thought that it would overtake and engulf me. The cloud finally settled at around the 500 metre level, lower peaks just about rising above it. 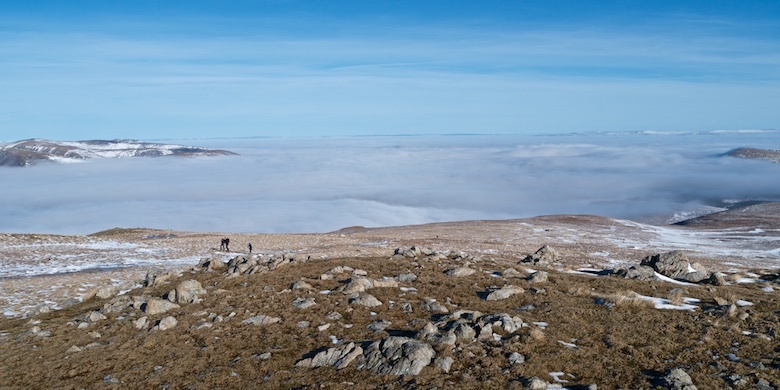 To the north of Skiddaw the cloud spread towards the horizon where it was met by a wall of Scottish Mountains. The crystal clear air meant that visibility was pretty much unlimited. Pictures say much more that words can. 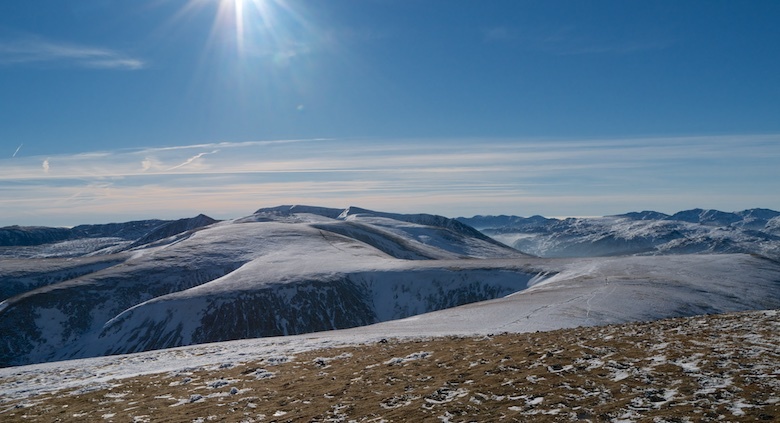 There was not a breath of wind and even though I was above 800 metres the sun felt warm, I was soon stripped down to just my baselayer the sleeves rolled up to my elbows. Reuben was panting away next to me. 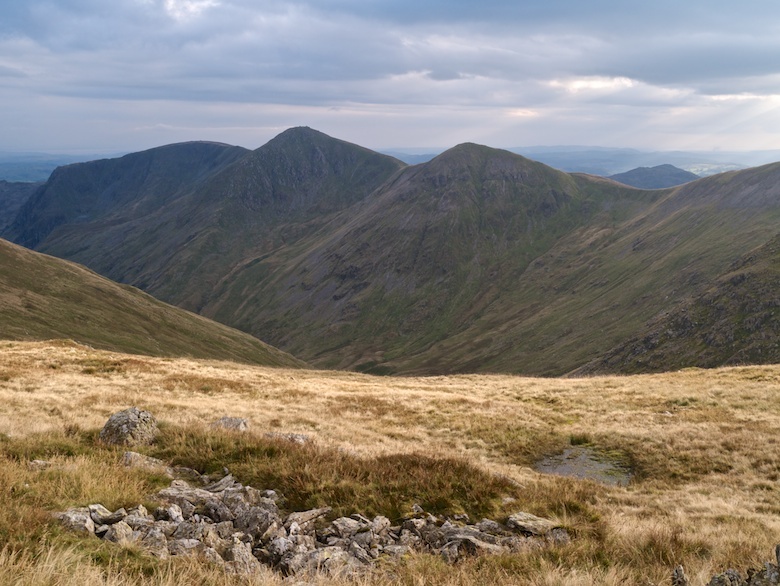 Watson’s Dodd was the main reason why I had chosen this group of fells to climb. 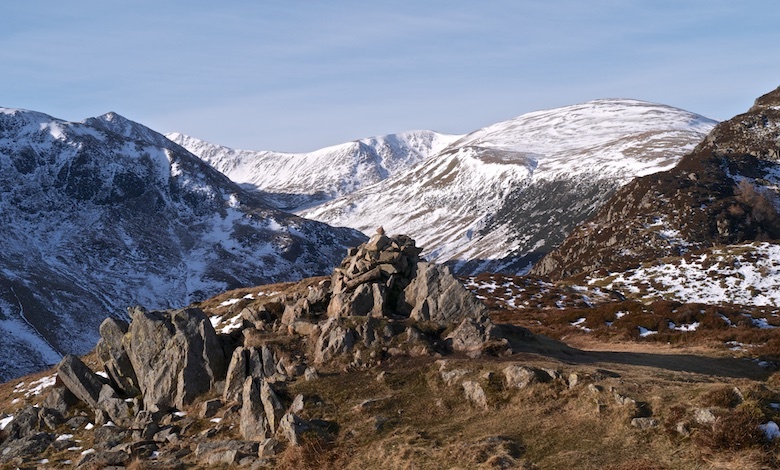 It is only recently that I have decided to tick off the Wainwright’s. Although I have climbed many of the Lake District hills I had previously bypassed this one. I’m glad that I had as I would not have experienced such a stunning day. 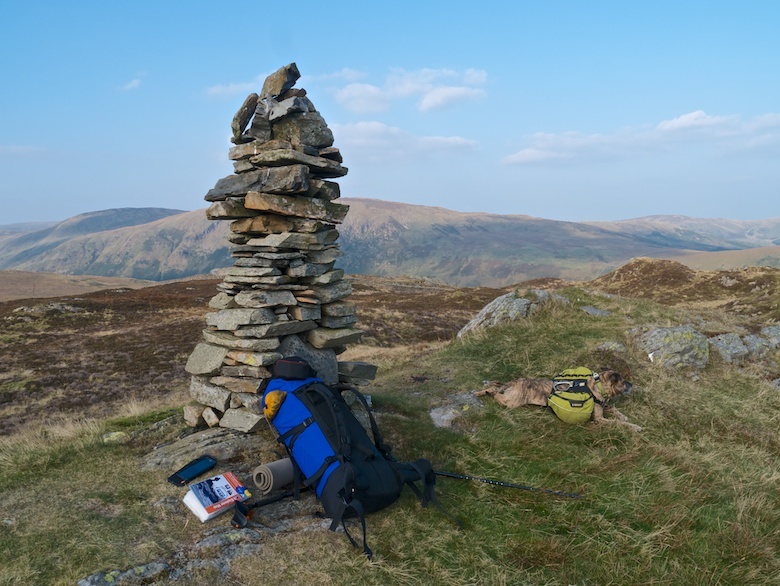 The cairn was occupied by a summit hogger so I descended a bit to seek some shelter from a breeze that had started to drift up from the valley. I got a bird’s eye view of the cloud that was beginning to break up, the sound of vehicles drifting up from the road far below their roofs glittering in the sunlight. Up on Stybarrow Dodd I could see the many skiers using the slopes on Raise, the Ski Tow in operation. It was busy over there but I enjoyed the solitude away from the main walkers highway as we descended towards White Stones. 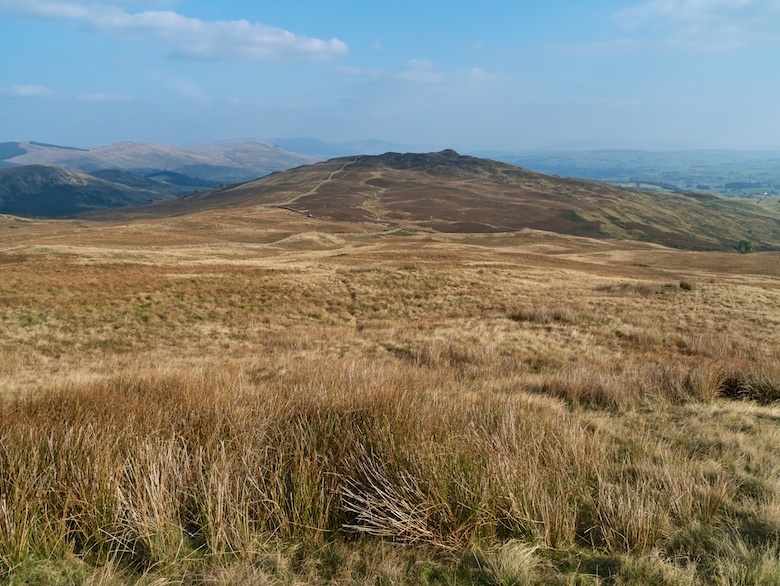 My legs were tiring on the long descent to Dockray via Birkett Fell and Swineside Knott. There were numerous ups and downs, the snow wet once again. However the views in the soft afternoon sun were outstanding. 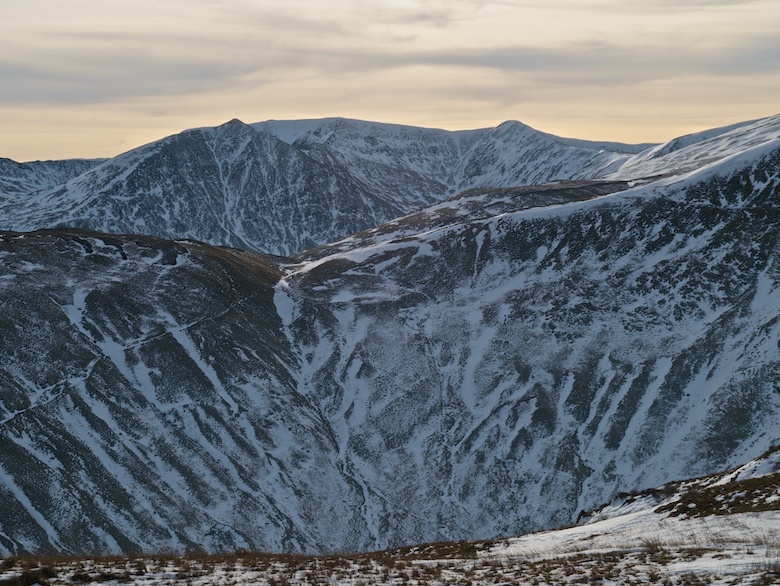 Helvellyn looked positively alpine in stature, snow and rock giving it a deep rich texture. 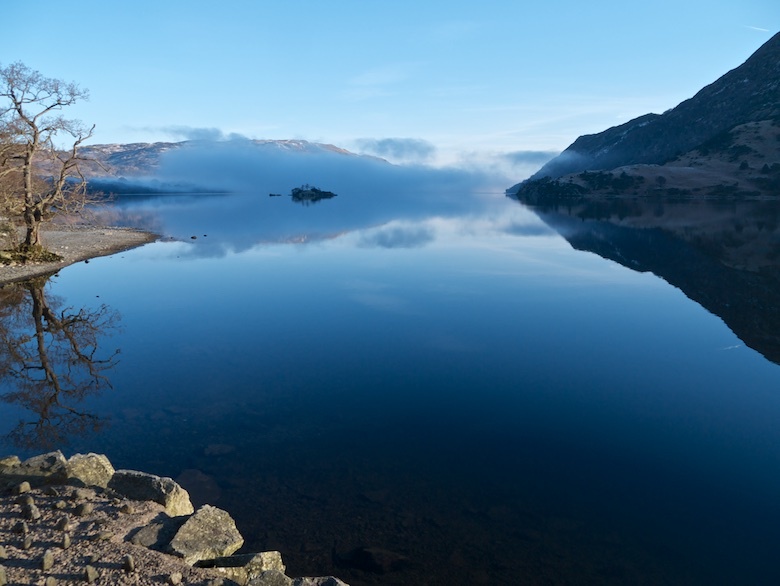 Mist was already beginning to form over Ullswater. Down at Dockray it was tempting to pop in for a pint, a comfy chair in front of a roaring fire would have been magic after a long day. However it was still a mile of up hill back to the Bongo and I knew that if I sat down I would struggle to get up again. I was also ready for curry out of a packet. The glamour of Bongo camping. 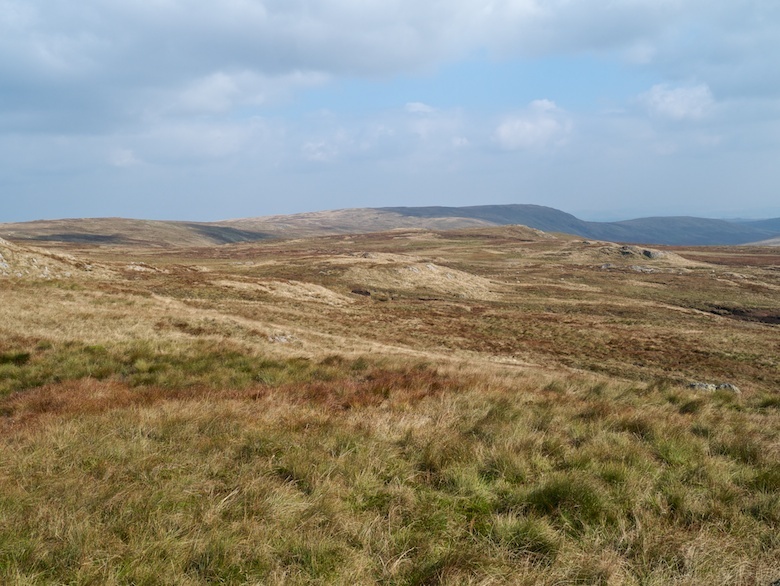 Mungrisdale Common – a boring hill? It was close to midnight and the spot where I had planned to park the Bongo for the night was buried under deep snow. I therefore did what I have never done before and ‘wild van camped’ in the middle of a village. Tired after a day at work and a long drive both myself and Reuben slept well, discovering in the morning that even rural Cumbria has a mini rush hour. 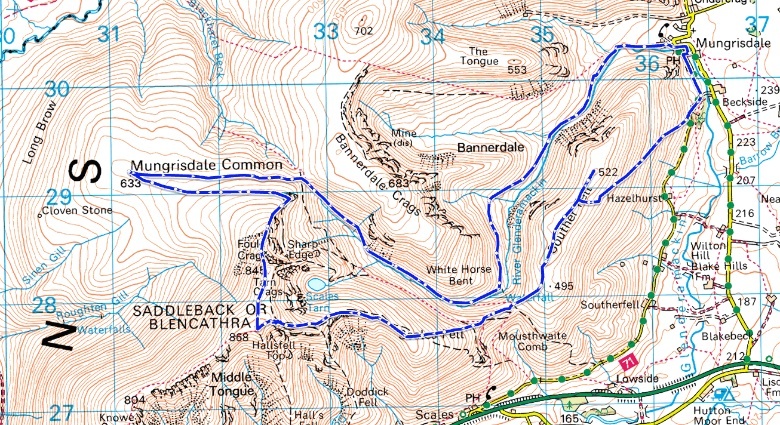 The plan for the day was to go and bag a couple of Wainwrights close to Blencathra that have so far eluded me. 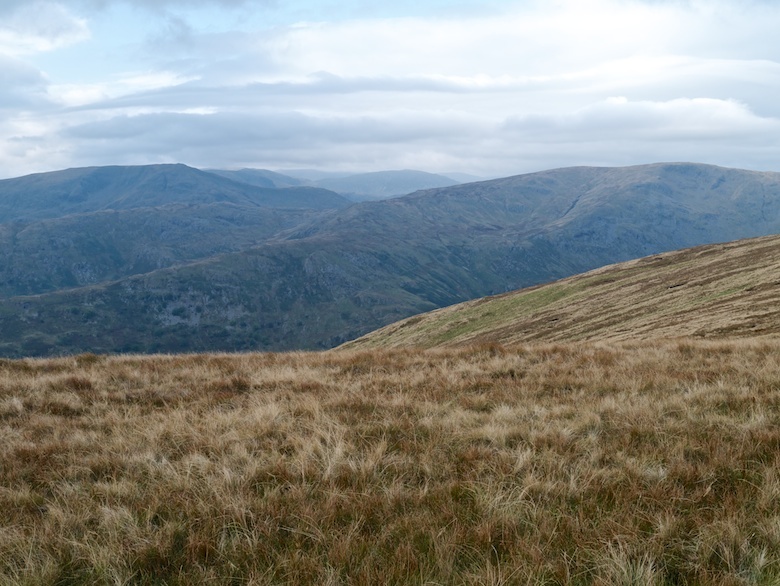 Souther Fell on the map looks nice and shapely and a bit Howgill in nature. 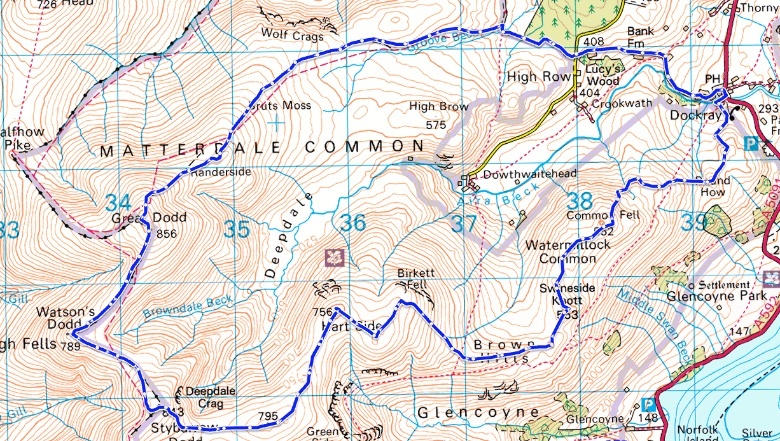 On the other hand Mungrisdale Common appears to not even be a hill, just a spot height on the boggy side of Blencathra. I though that it would be best to explore on a murky school day in the middle of winter. 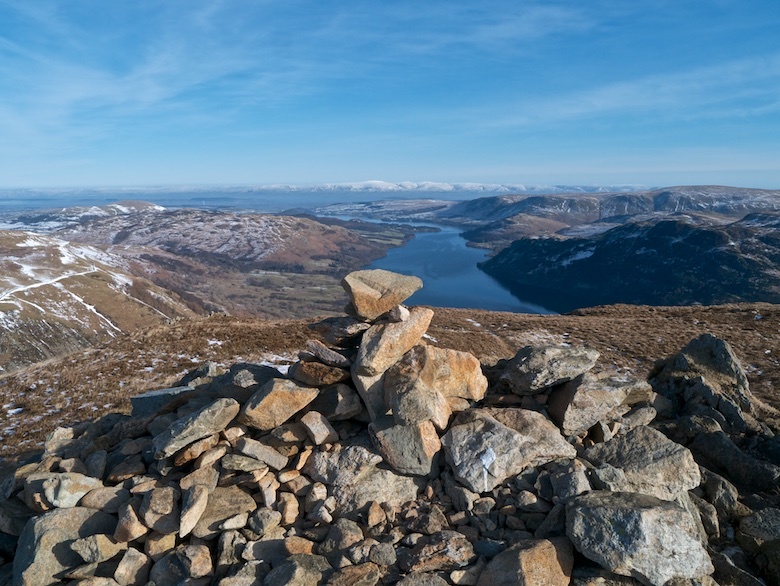 That way I could escape the crowds that were bound to be hogging the no doubt impressive summit cairn. 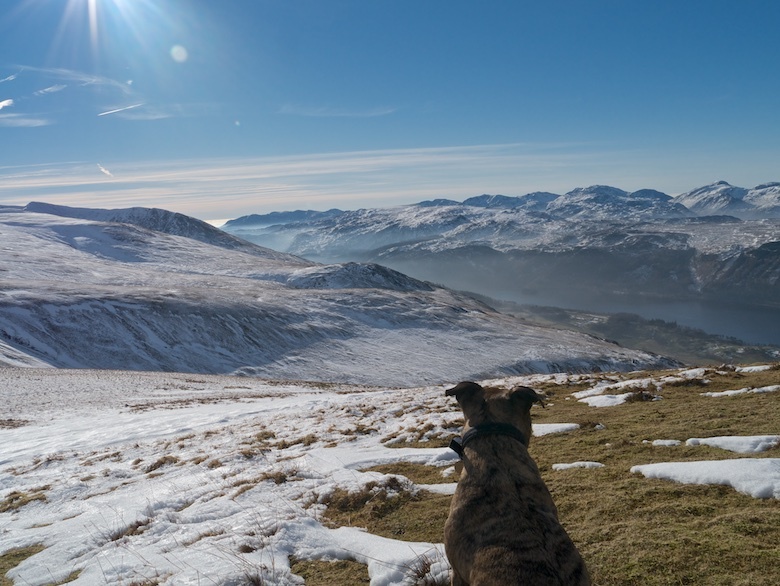 I led Reuben out of Mungrisdale without too much of a plan of how I would link the two hills together. Souther fell looms over the village so it made sense to climb it and get the lung bursting climb done first. I found the rapidly thawing snow hard work and picked a route along patches of grass. Reuben thought that the whole snow thing was loads of fun and acted like he has never seen the stuff before. 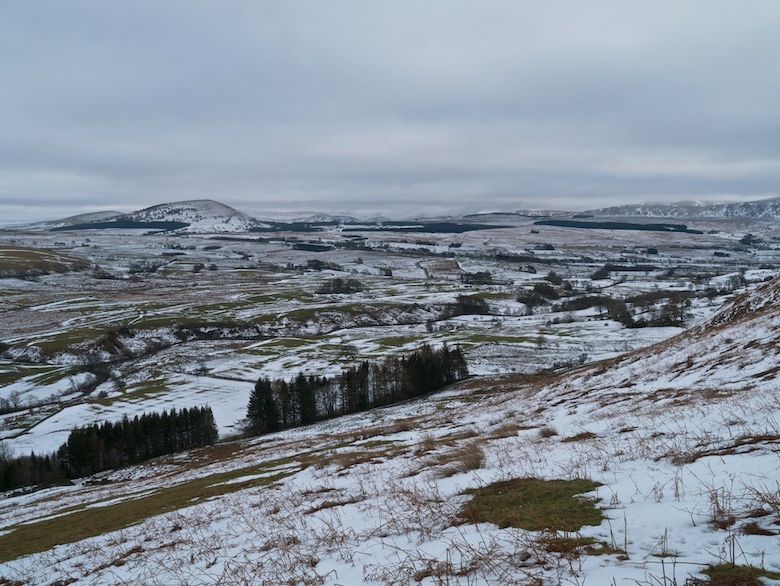 Souther Fell gave a pleasant promenade with higher peaks towering above and views out across the Eden Valley. Reuben got very enthusiastic meeting a Border Collie who did not know what to make of having his face licked vigorously. 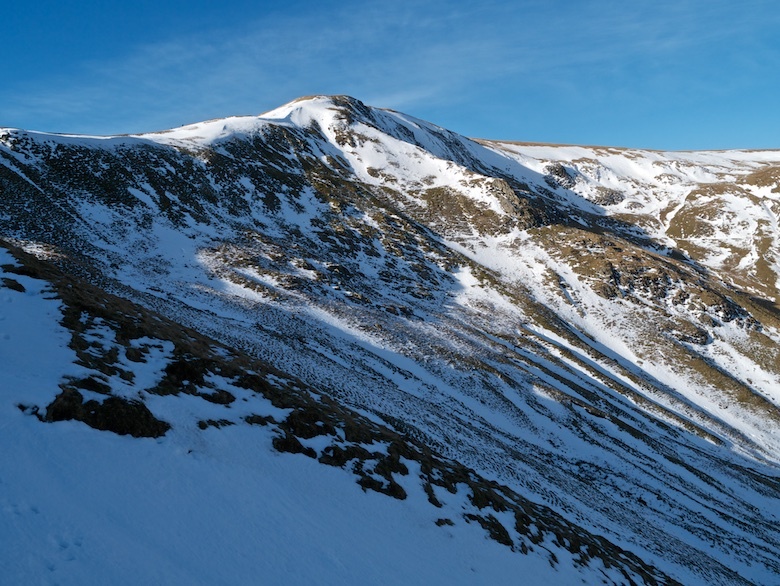 I had thought about continuing along the path above the River Glendermackin on the south side but I was worried about the steepness of the snow slopes at its head. 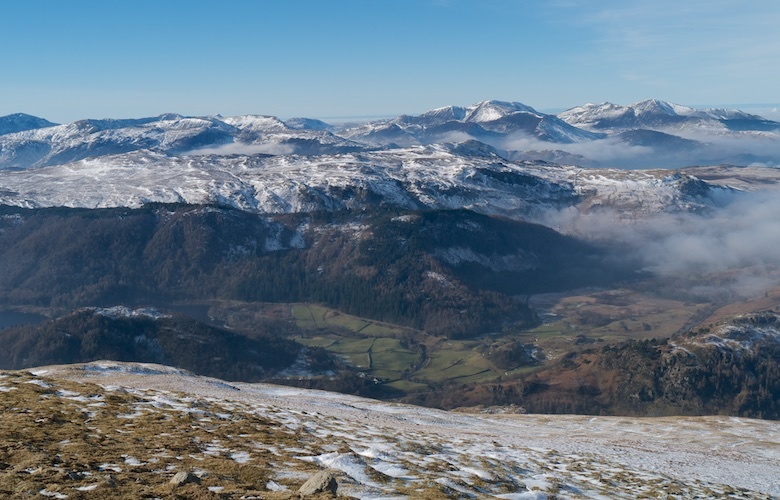 Instead I decided to continue up Scales Fell and climb onto the summit of Blencathra. This I later realised was a very wise move. Despite the snow it was easy going up the path and I only needed my microspikes for the last hundred metres when the snow got particularly crisp. Reuben met another Border Collie on the way up who positively encouraged him to lick his face vigorously. They bounded around while I chatted to the owner. The theme of the following couple of days was the friendliness of fellow dog owners whilst many other folks could barely manage a smile. 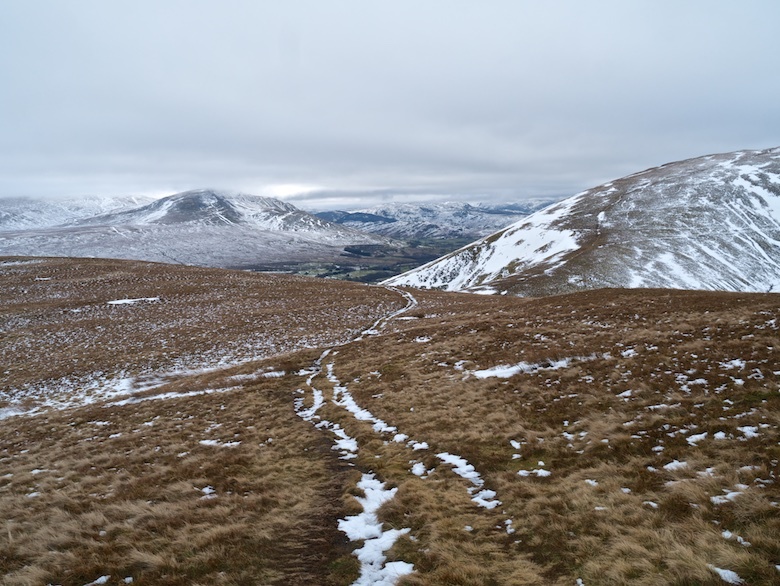 There was no view on the summit of Blencathra so we crunched along the icy plateau and started the descent to Mungrisdale Common. I made an initial false start when I realised we were heading for Sharp Edge which meant climbing back up before finally locating the correct path down. 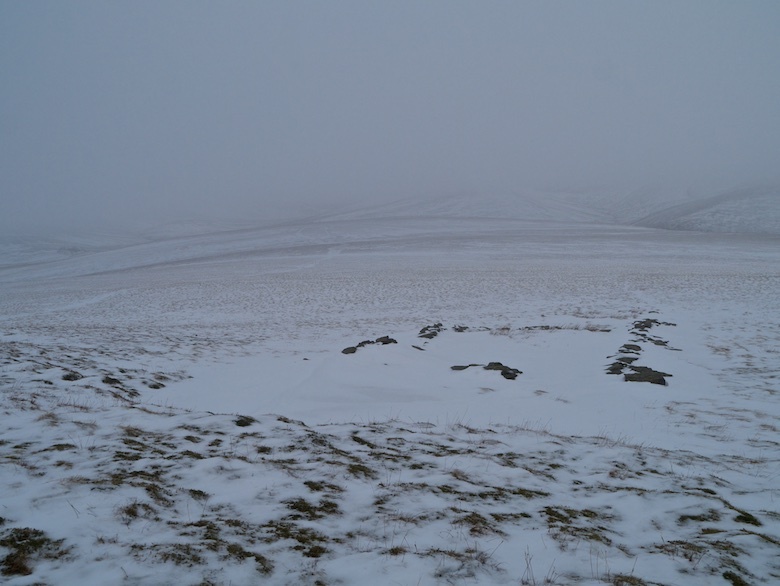 Snow and mist made navigating rather tricky. I need to remember that the compass knows better than I do. 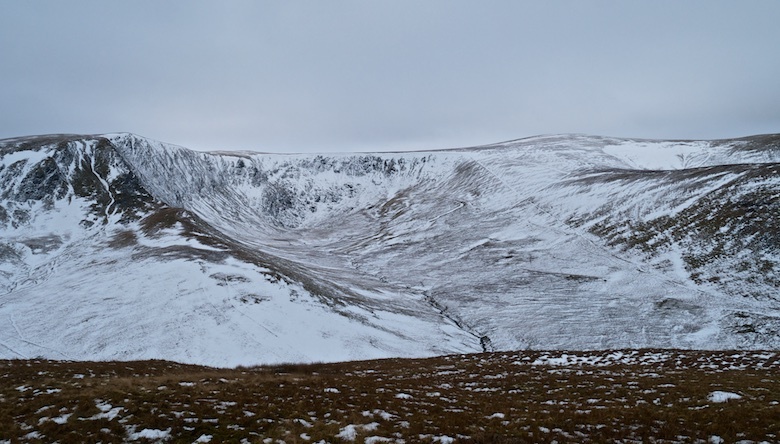 The land behind Blencathra is about as different from Sharp Edge than it is possible to be. 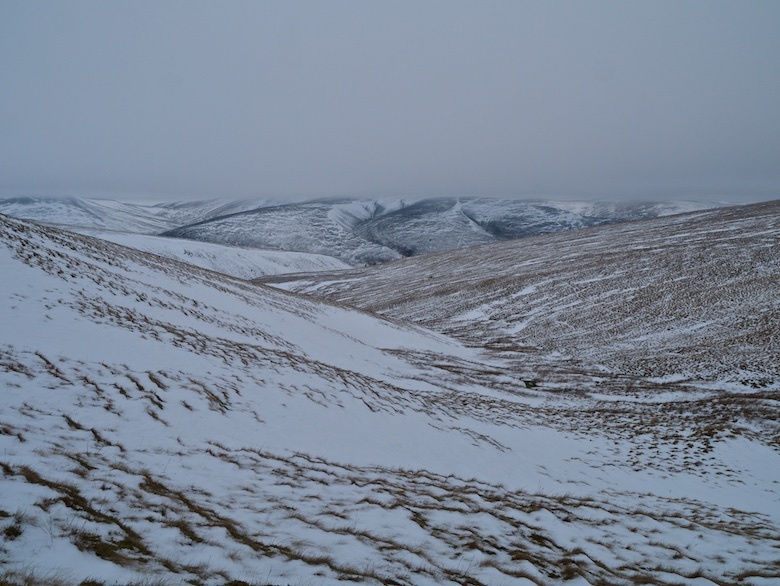 With a covering of often deep snow and with cloud hanging low it certainly felt a wild and woolly place. 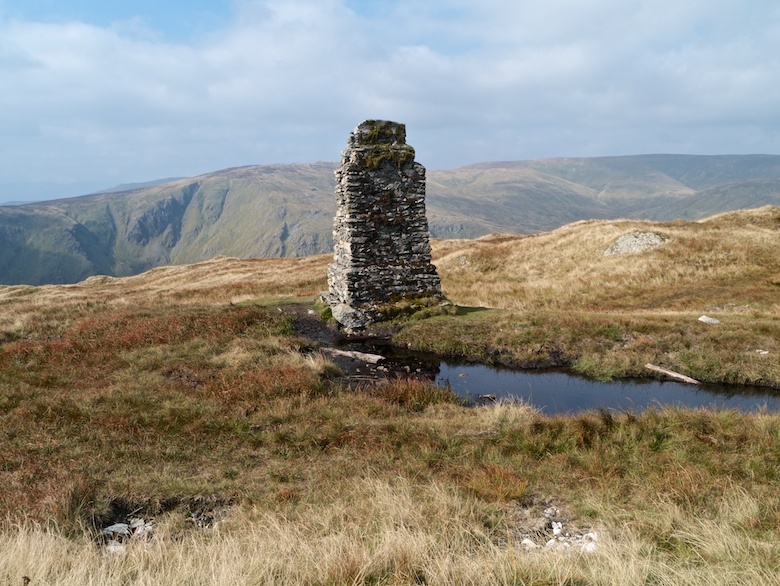 It was a good yomp to the summit of Mungrisdale Common where I sat on the rather insignificant cairn and ate my lunch. 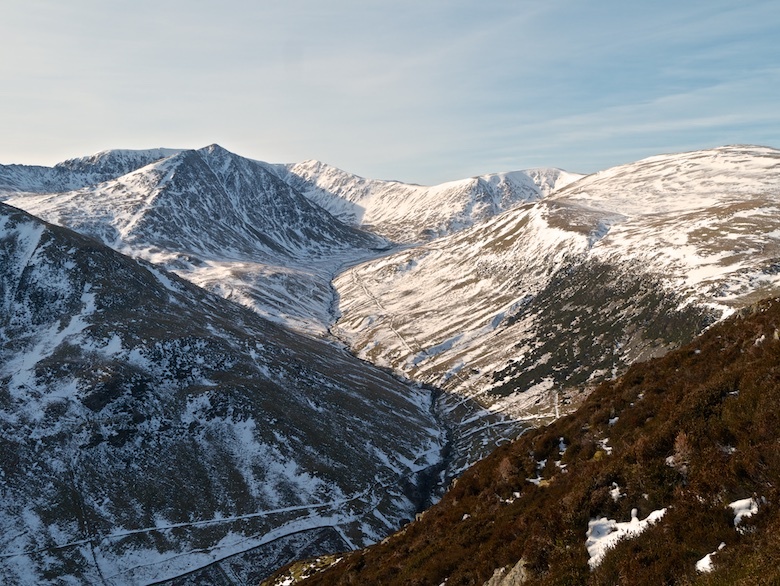 I have to say that I think that Wainwright picked a rather fine spot to include in his 214 Lakeland Fells. It was probably the weather but I felt that I was in the middle of nowhere rather than in the compact and busy Lake District. I might even come back and spend the night. 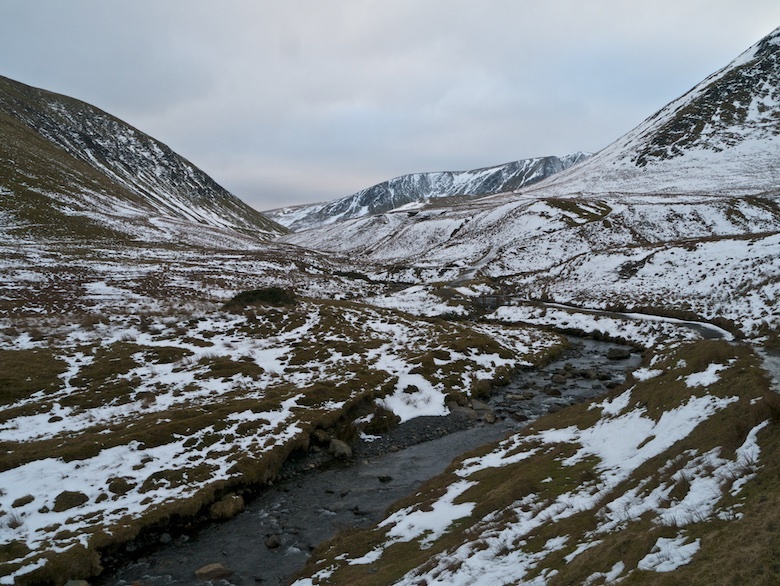 The soft snow made walking slow and laborious as we contoured round to the head of the River Glendermackin. There I came across the debris from a large avalanche, slabs as big as a sofa piled up on top of each other. 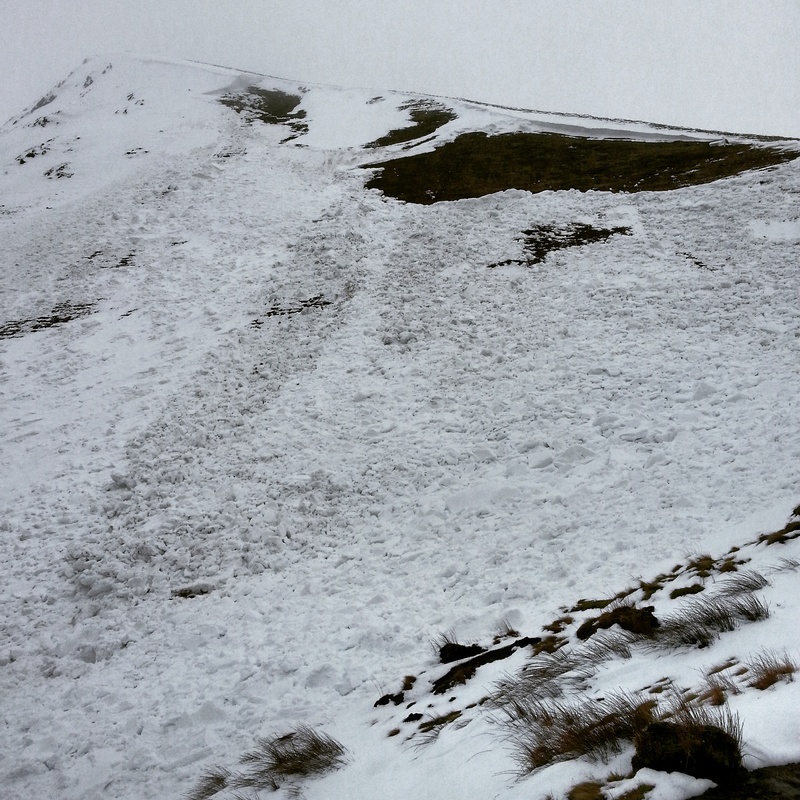 It is hard to say when it happened but I was glad that I had climbed Blencathra earlier in the day. 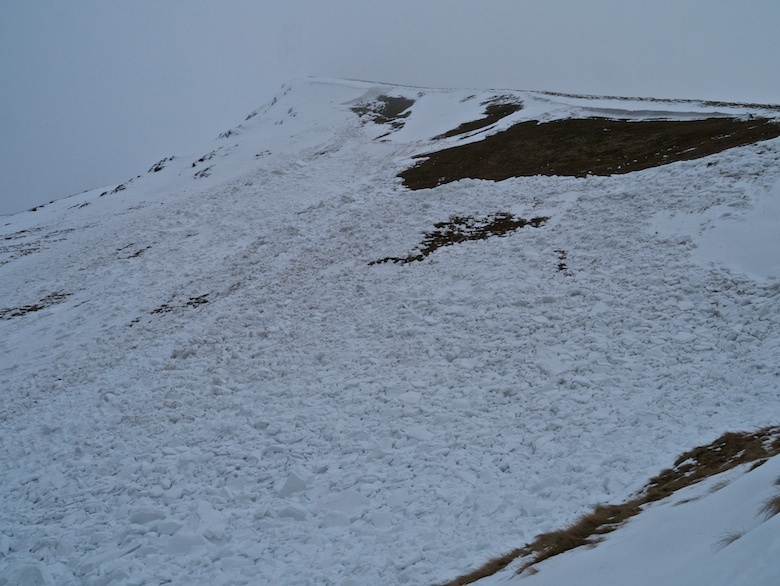 The alternative would have involved traversing directly across the slopes now covered in debris. The River Glendermackin carves through a lovely valley and I enjoyed the long walk along its length back to Mungrisdale. Back at the van I decided that it would probably be a bit rude to spend another night sleeping in the Bongo in the village. 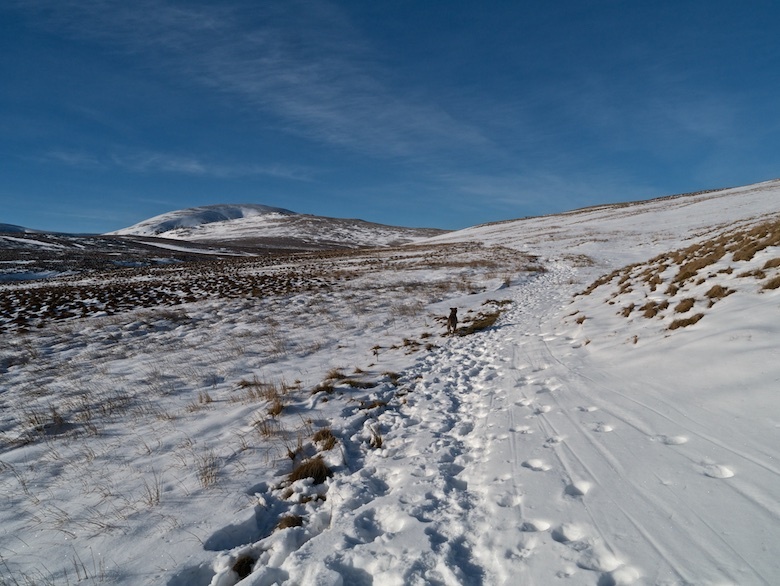 I headed off into the hills ready for another snowy walk the following day. A cracking three days was spent in the Lakes over the weekend. By day I was sweltering under a hot sun in just a base layer whilst at night I was shivering under piles of down. 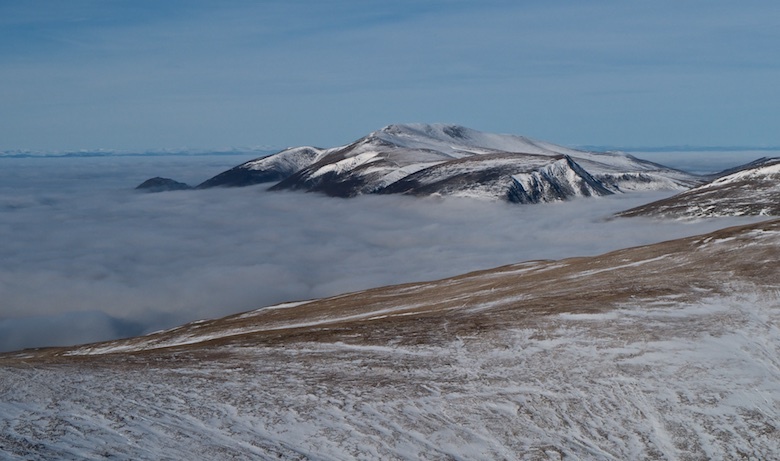 I passed the debris of a substantial avalanche and then marvelled at an extensive inversion. Danger lurks amongst the beauty on these small hills. Reuben is now refusing to leave his bed, after the freedom of the hills he’s a broken dog. A couple of snaps straight off my phone whilst I suffer a spot of blog writing lassitude. 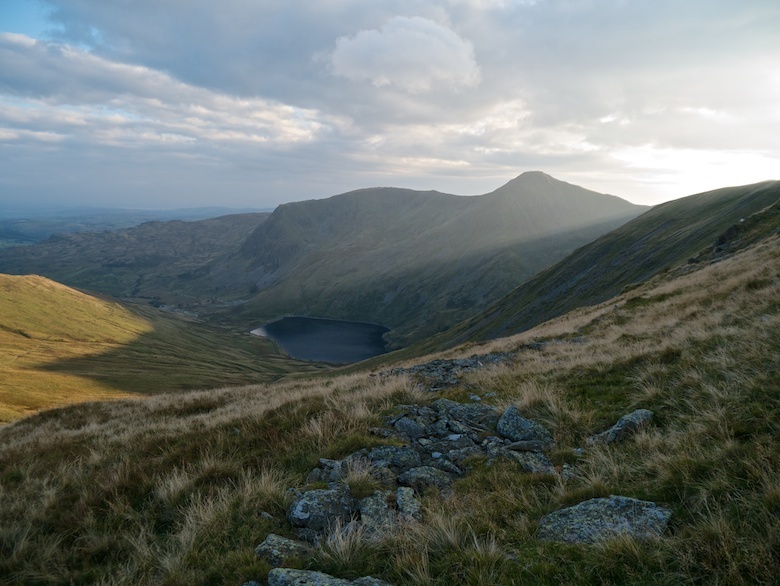 It was time for one of my infrequent backpacking trips to the Lake District. Time to put on my best smile and practice saying hello every ten minutes before visiting one of the busiest mountain areas of the UK. It was late afternoon when I pulled into the small car park next to the community hall in Longsleddale, an isolated valley in the south-eastern Lakes. There was initially a bit of confusion as I could not find the pay and display machine into which to pour a weeks worth of wages. Instead there was a box asking for a donation of £2 a day to go towards the upkeep of the hall and public toilets, even I can’t find fault with that. It was warm for September, unpleasantly warm as I walked north along the lane with Reuben. I was actually worried that it may be a bit much for him as usually at the start of a walk he is very enthusiastic and pulling at the lead. That afternoon he was simply trotting alongside with his tongue hanging out like a half-formed slice of spam. 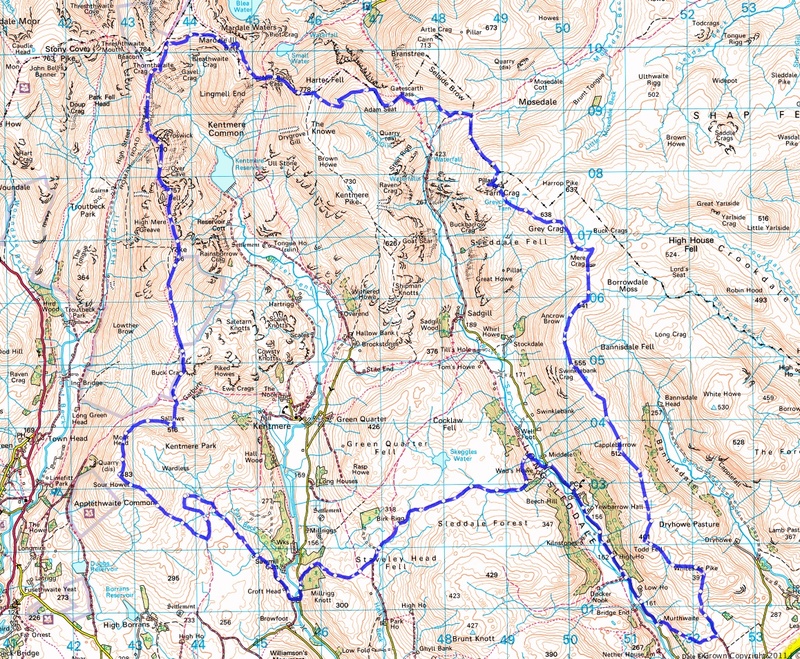 The plan for the day had been to climb onto Yoke and wild camp next to Rainsborrow Tarn, however my heart was not in for a big walk that afternoon. I decided that I would sit in the shade and examine the map for a camp spot that would not involve much effort to get to. It turns out that the bridleway that leads from Ullthwaite is not a good place for a sweaty backpacker and his hound to rest. The first mountain biker nearly ran over my leg whilst the second missed poor Reuben by inches, the third swept up a rock that just missed my head. At least I had got myself out of the way of the fourth and fifth. Bloody backpackers getting in the way eh? 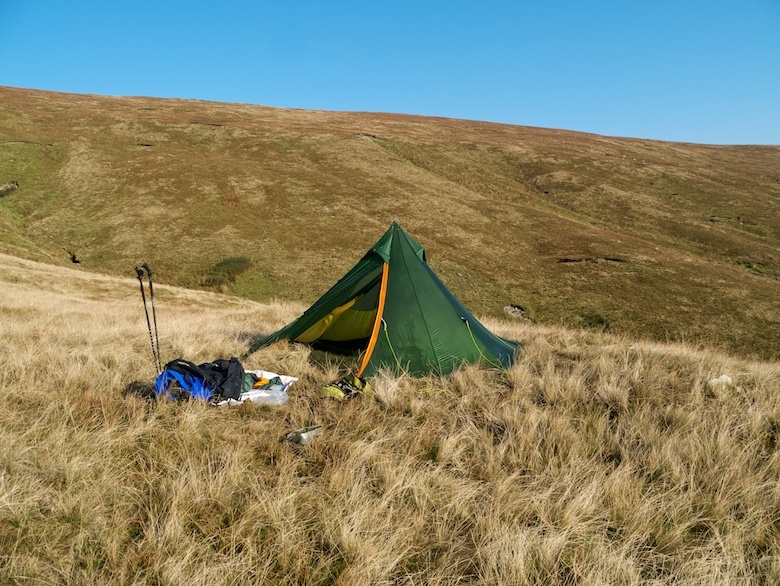 I settled on a rare low-level wild camp, although I made sure that I was out of sight of any buildings and paths. The air was incredibly still and humid, perfect for the last few of the seasons midges. My shelter was dripping with condensation even before it got dark and it was a rather sweaty night where I had my sleeping bag unzipped. A fine misty drizzle fell after dark. It was grey, overcast and uninspiring when I woke up, even the lower fells were hidden under a thick duvet of clouds. I did my favourite backpacking thing which involves turning over and going back to sleep for a few hours. When I had eventually finished making brews, having breakfast and packing it was gone midday. Slackpacking at its finest. 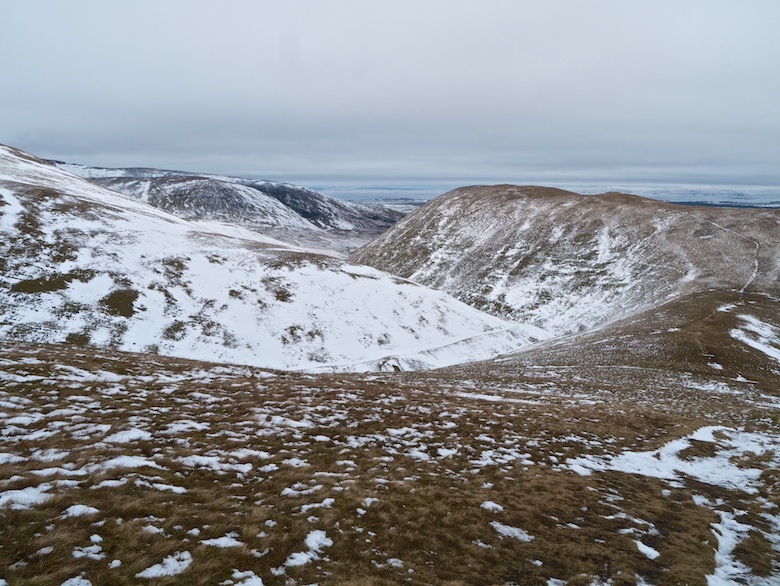 I picked a totally rubbish way up Sour Howes that involved tussocks, deep rushes and bogs. Once at the top I could not decide which of the numerous lumps and bumps was the true summit. I therefore visited all of them, from each one the others looked to be higher. It was then a case of following the ridge round to Sallows which was just beginning to lose its cap of cloud. 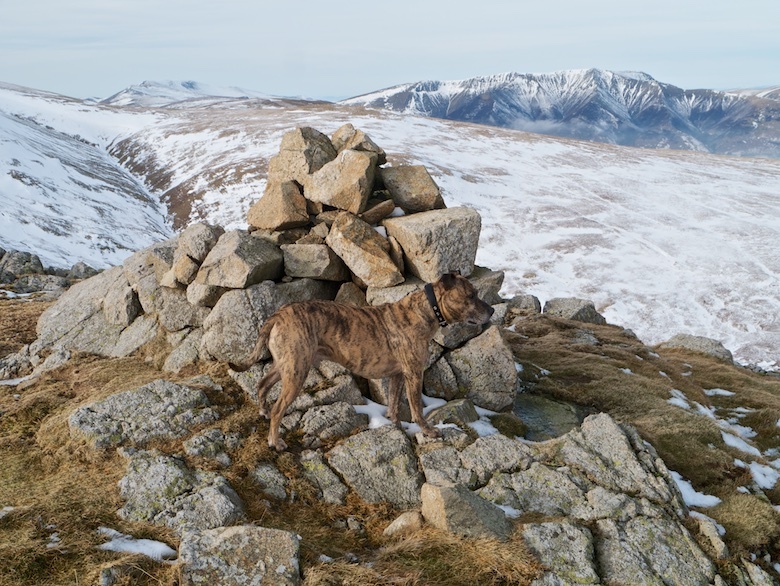 It was along the way that for the first time Reuben met another Staffy on the hill, it was having a great time bounding along with a couple of fell runners. 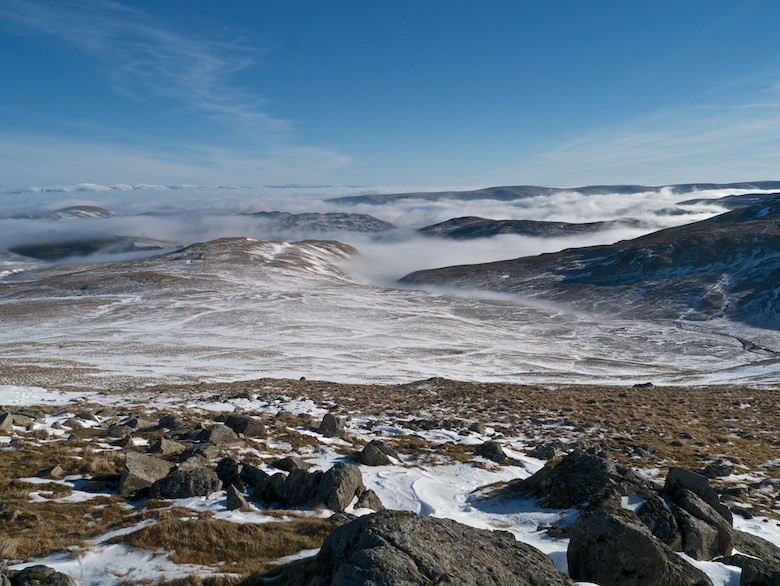 The cloud suddenly dissipated on the ascent of Yoke, melting away to reveal extensive views under a soft light. 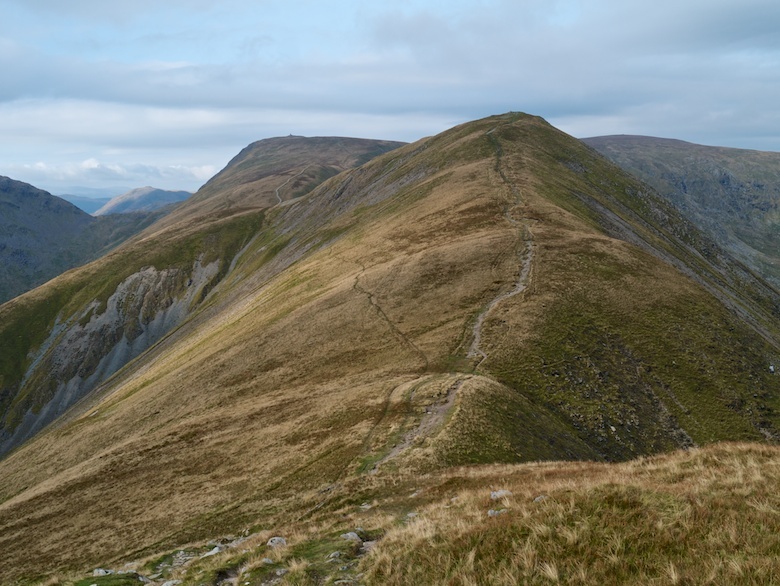 The rollercoaster of a route north over Ill Bell and Froswick was a delight, only spoilt by the overly manicured path that in places is more suited to a city park. 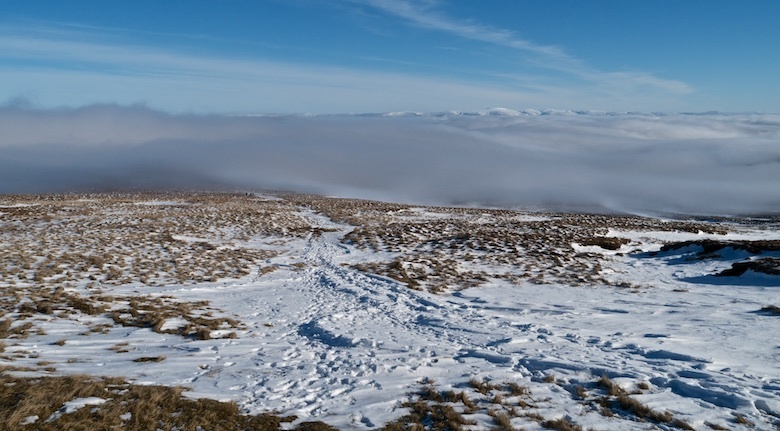 I was surprised to have the hills to myself, perhaps people had been put off by the low cloud. After a late start and unhurried walk I was reaping the rewards by being on the hills during the late afternoon, the sun working its way towards the horizon. 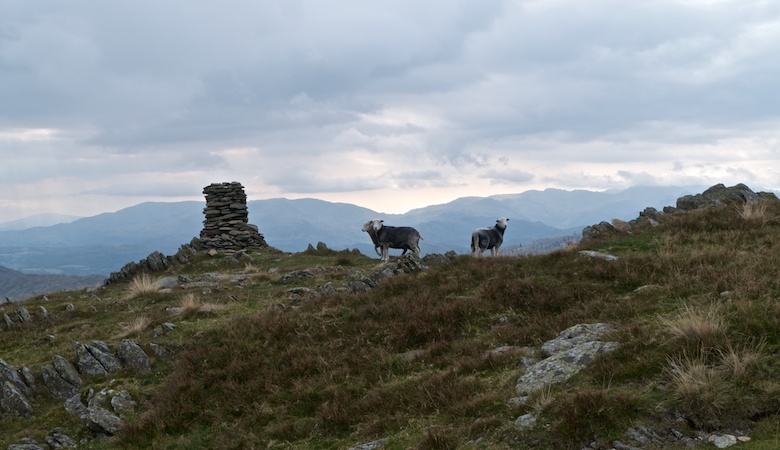 The fells were taking on a purple hue, shafts of sunlight occasionally piercing the broken clouds. 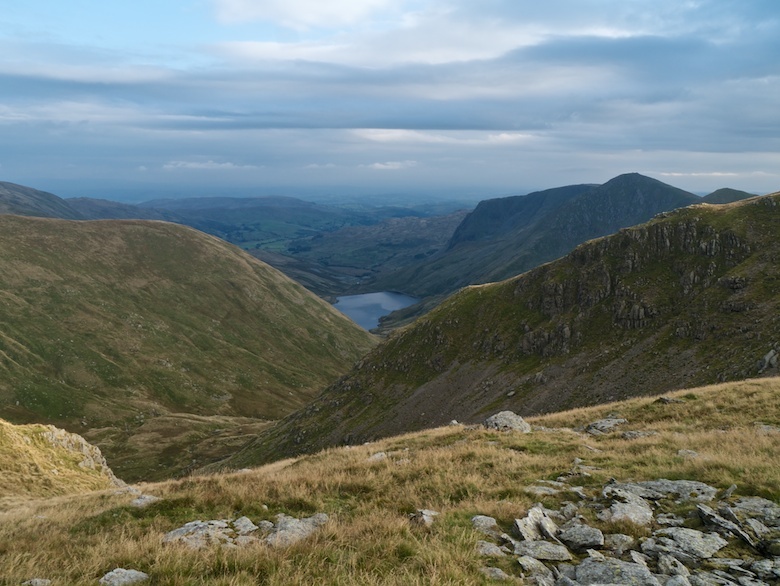 I enjoyed the high level contour round the head of Kentmere, working a way round to drop down to the Nan Bield Pass on a narrow path. 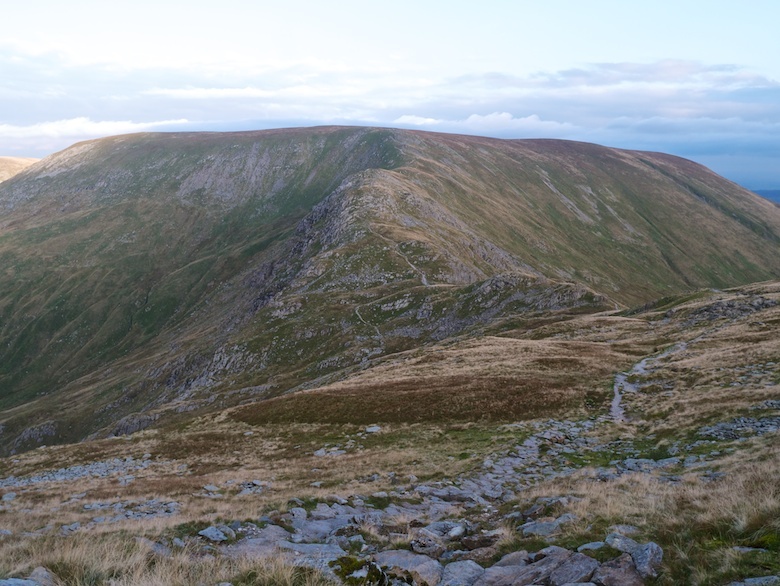 Harter Fell was the last hill of the day and I fancied camping on its summit. However the wind was too strong and the ground parched, the upper reaches of the stream had dried up a long time ago. We descended down into Wren Gill, locating a reasonably flat spot on a spur above the watercourse. It was dark by the time I had pitched the Wickiup and collected water. The shorter days of early Autumn had nearly caught me out. The night was cold and clear, stars filling the sky when I poked my head out in the middle of the night. It was even colder at dawn and my shelter was dripping with condensation. I watched the shadows gradually recede and waited for the warm sun to reach us before getting out of my sleeping bag. The sky was a deep blue without a cloud to be seen. 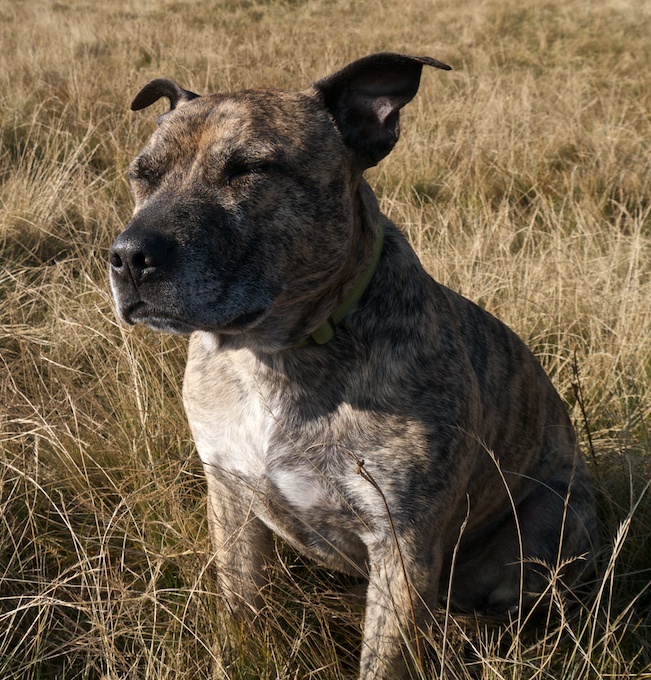 Being released from the confines of the shelter into warm sunshine made Reuben a very happy dog. 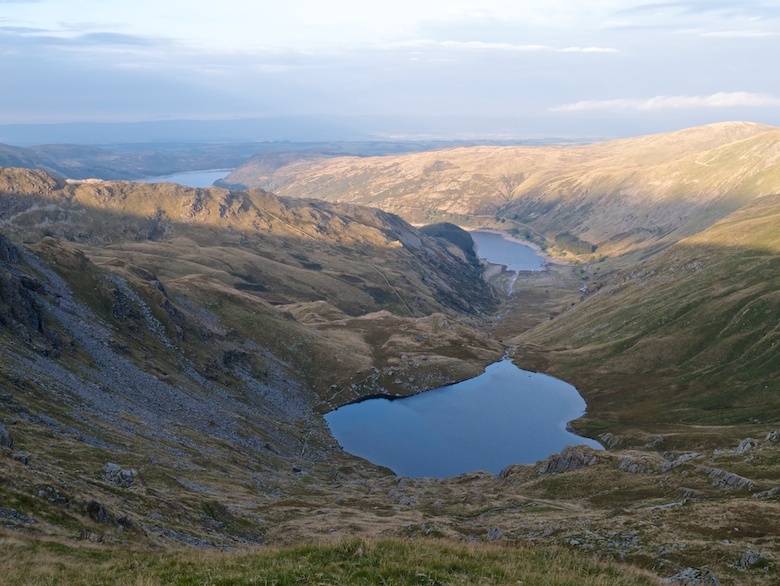 It was a tiring contour around steep slopes to get to the summit of Adam Seat before descending to Gatescarth Pass. 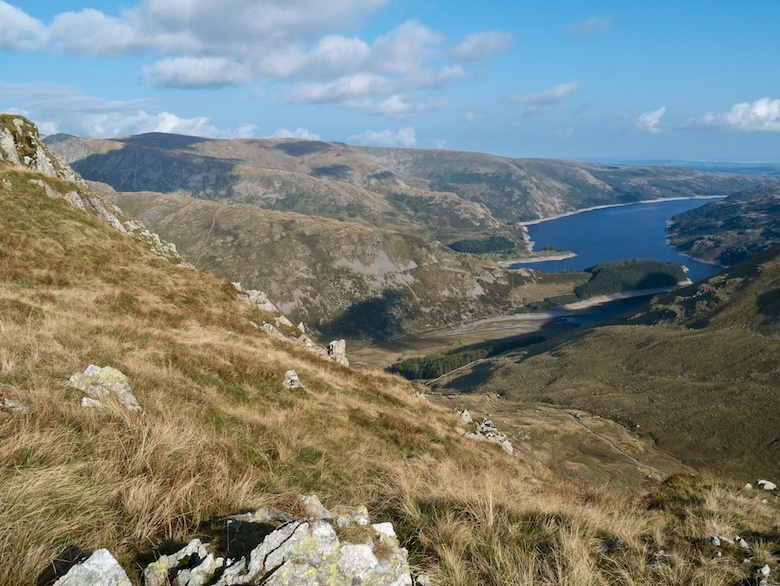 Haweswater gave a good backdrop, leading the eye out of the Lake District and towards the North Pennines. I originally had grand plans to go and bag Selside, a Nuttall that still eludes me. 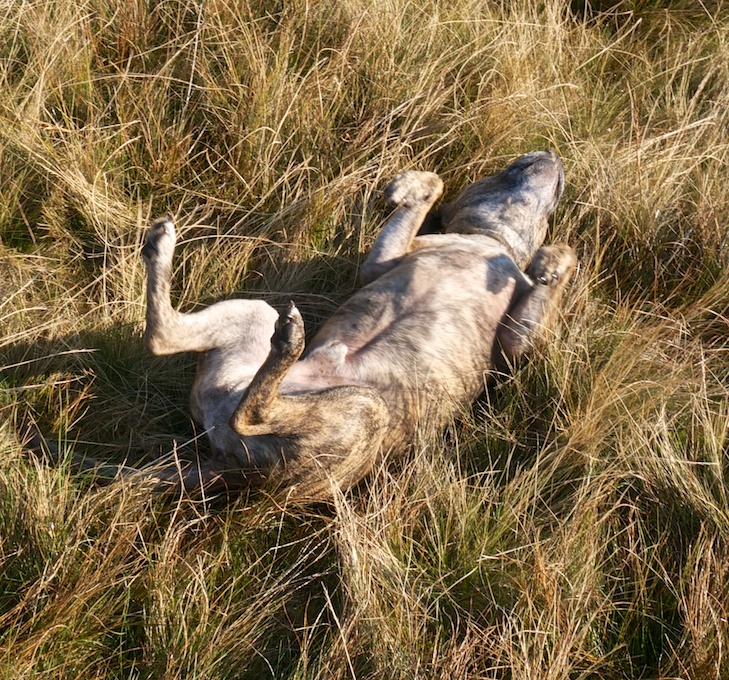 However after the short afternoon walk on the first day I was now too far behind schedule. 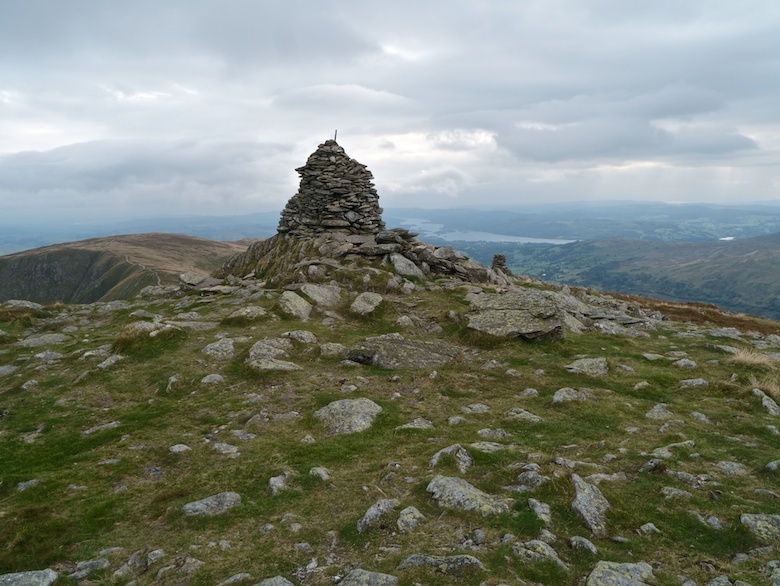 Instead I headed south towards the car, taking in the summit of Tarn Crag with its distinctive stone pillar. 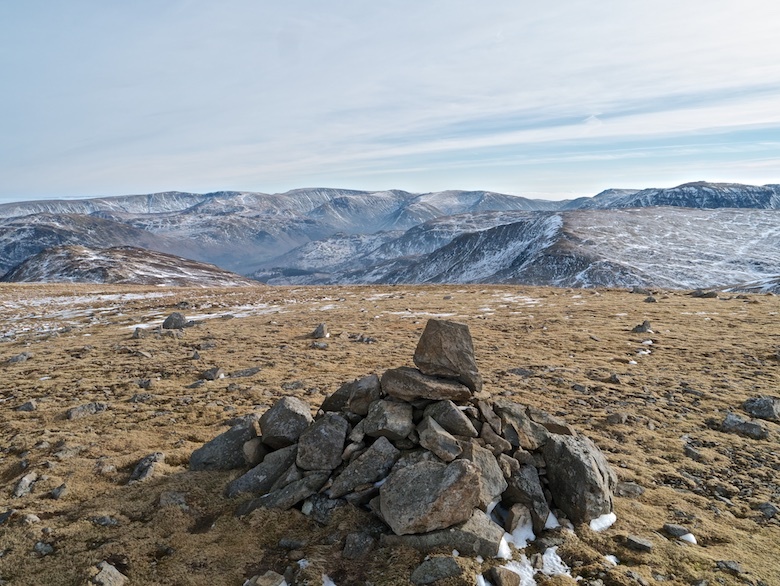 There then followed a grand walk south over the silent and empty fells that form the eastern boundary of Longsleddale. I met one couple and saw another in the distance that hot and sunny Sunday afternoon. It felt like we were in the Howgills rather than the Lake District. The various ups and downs felt much more than the map suggested, not helped by the lack of running water. I had to drop down on one occasion to ensure that both Reuben and I remained hydrated. The last hill of the day was Whiteside Pike, guarded from the north by a drystone wall with no gate or stile. I eventually found a tumble-down section, probably in that state due to there being no gate or stile to help access. 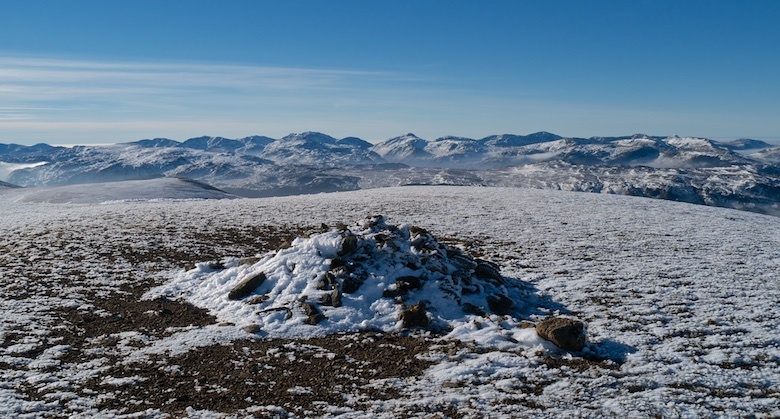 The summit is marked by a tall and precarious looking cairn that is much more sturdy than it appears. 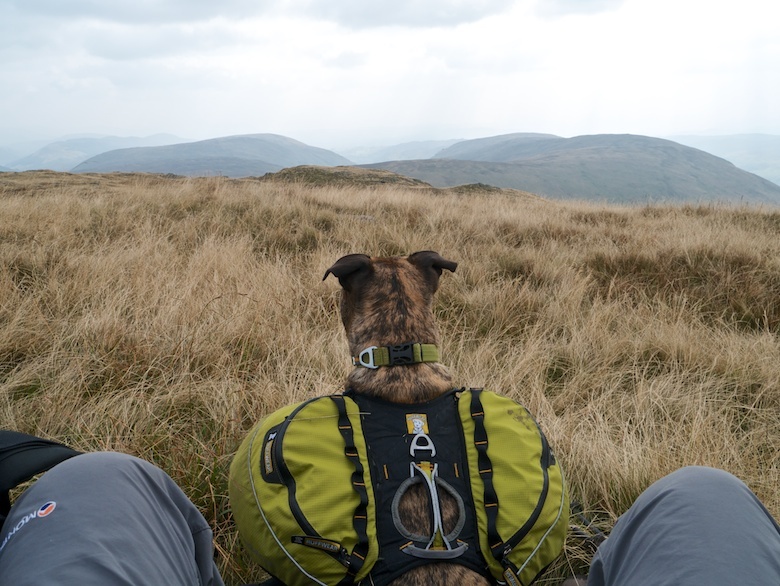 It was a good spot to rest before descending back to the road and the long slog back to the car.